The 2005 National POW/MIA Recognition Day Ceremony was held yesterday at the National Memorial Cemetery of the Pacific at Punchbowl. The isle ceremony was held in conjunction with others throughout the nation and world. 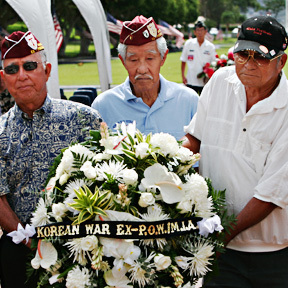 Above, Susumu Shingawa, left, Nick Nishimoto and Goichi Tamaye laid a wreath during the ceremony. All three were POWs during the Korean War.